This is the thing you are waiting for long time, iOS 8.1.2 jailbreak with Mac support for install Cydia iOS 8.1.2. Finally, untethered PP jailbreak has released iOS 8 – 8.1.2 iPhone, iPad & iPod jailbreak on Mac. So, Mac users also can enjoy iOS 8.1.2 jailbreak features with Cydia download & install on their devices. These are the jailbreak instructions of PP jailbreak for iOS 8 – 8.1.2 on Mac OS x. You are able to get Cydia iOS 8 – 8.1.2 within few minutes & few clicks with this all new PP jailbreak tool. It provides super fast & easy jailbreak experience for Mac users never before. 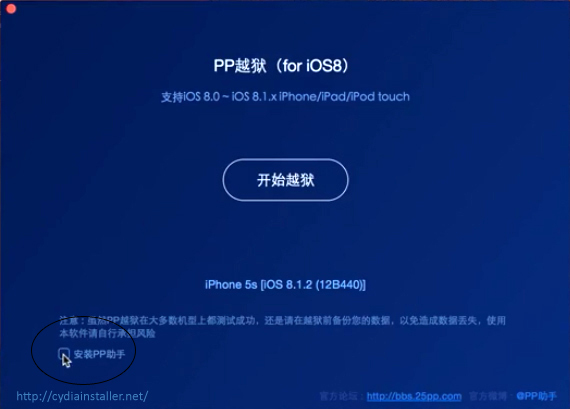 *How to install Cydia for iOS 8.2 beta using PP jailbreak ? If your idevice not with latest iOS 8.1.2, Recommend to upgrade your device up to iOS 8.1.2 using iTunes. Over-The-Air [OTA] updated devices may fail jailbreak. So, that must be clean restored to iOS 8.1.2 with iTunes before the jailbreak. Backup your important data using iTunes. It will safe you if something got wrong. Turn Off Touch ID & Passcode, Find my iPhone and move into AirPlane mode. You have to get support with Mac computer running OS X 10.7 or higher versions. How to jailbreak with Cydia install? Step 3. Double click on downloaded “ppjailbreak.dmg” file to mount. Step 4. Drag the PP jailbreak app over to Applications folder. Step 5. Go in to the Applications folder, double click on PP app & launch the program. Step 6. Then jailbreak program will open & detect your iOS device. Step 7. Click the button in the middle of the screen to begin jailbreak process. Make sure tick-off the little checkbox in the left-bottom-corner to prevent unwanted things to install. Step 8. Click on the button in the right hand side to continue the PP jailbreak process. Step 9. Then, it will process the jailbreak. Keep idevice connect and wait patiently for few minutes. The jailbreak is complete, you will see the confirmation in the computer screen by the green right mark and your idevice will automatically reboot. Step 10. After all, unlock the device and you can see Cydia app on your home screen. Then, Turn Off the AirPlane mode and tap on the Cydia icon to prepare the file system. 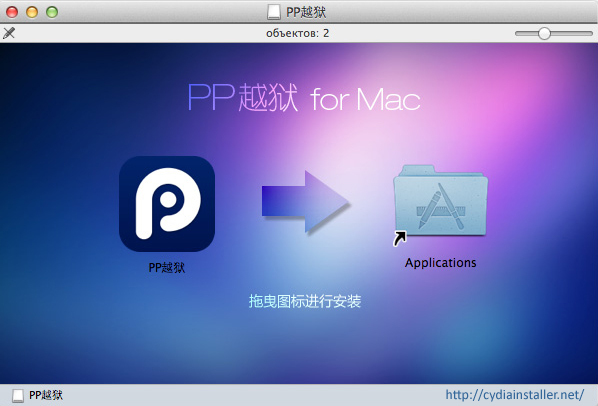 This is how to install Cydia for iOS 8-8.1.2 devices using PP jailbreak for Mac users. If you works with Windows, you can get Cydia with TaiG jailbreak for Windows by using following link..
‹ iOS 8.1.2 jailbreak for Mac released with new PP jailbreak. Yes.. You can jailbreak your device without any matter. I clicked the install button for the chinese app by accident. Now, I want to delete it but I can’t unless I have to restore my iPhone but I have lots of data of my games. I want to delete it so much. Please help me. Thank you. Pls Connect your device to computer and try to remove using iTunes as software remove from your device.